Evidence for the people side of business exists in successful businesses. The Psychologically Healthy Workplace Awards program demonstrates that there are many businesses which not only take care of their employees, but also succeed at developing healthy, productive employees. Achieving a work culture that is positive and productive takes leadership and an awareness of the needs of employees. Organizations are led by people who are usually experts in a technical area and/or have training in business. But there is a third requirement for organizational leadership, skill in the people side of business, which too many leaders lack or are less aware. Taking care of people – and providing adequate structure – is not often trained, is not easily quantified, and is as much art as science. 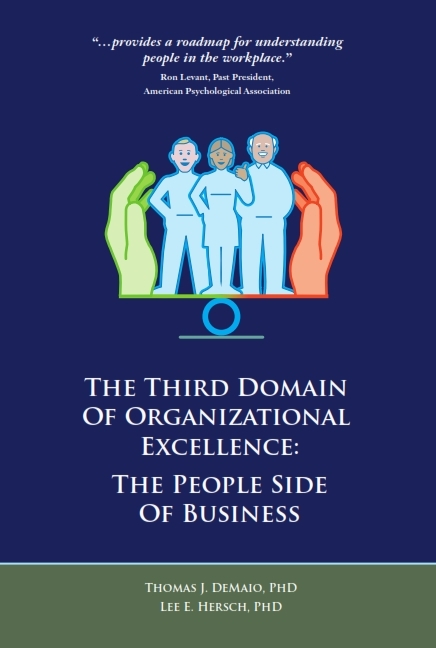 Consequently that third leg of running a business, the people side, is often short changed, handled “if possible”, and not made a focus of organizational structure. It is a terrible mistake because inadequate effort on this front too often leaves workers dissatisfied, unhappy, and less productive. Sometimes it leads to costly and dangerous mistakes. Think of hospital workers who have delivered the wrong drug, or air traffic controllers asleep at the job, or people in manufacturing being sloppy in assembly. Learning the people side of business is not so easy in today’s busy work culture. Leaders and managers were not trained as psychologists or people specialists. In fact, most have no training at all. And if you try to get trained, the information is all over the map. Most books available to business people argue for one idea or the other. Drive, yes, that’s the issue. No, wait, accountability. How is anyone to pull it together into a sensible whole? This is why we wrote The People Side of Business: Six Psychological Principles (to be published in July). The approach to employees needs to be comprehensive and balanced. Working people need to be accepted as emotional beings in need of encouragement and nurturance. They work best in a family-like environment, with the opportunity for growth and development. They also need structure and accountability to the mission and goals of the organization. My coming posts will focus on more of the specifics needed to create a dynamic, high performance work culture.